Several members of CW3E spent a recent weekend observing the North American monsoon in the Tucson, Arizona area, including Nogales and Sonoita. It provided an opportunity to experience an iconic type of “extreme event” that occurs in the Western U.S.
Activities included early-morning hiking in Ventana Canyon (Fig. 1), touring southern Arizona from Tucson to Nogales, Patagonia and Sonoita, learning about Sonoran Desert and nearby grassland landscapes and climate (Fig. 2), observing long-lived monsoon convection and its impacts, and discussing active topics of research related to the North American monsoon, including a recent paper on the role of the Chiricahua Gap (Ralph and Galerneau 2017 – http://journals.ametsoc.org/doi/abs/10.1175/JHM-D-17-0031.1). Fig.1. 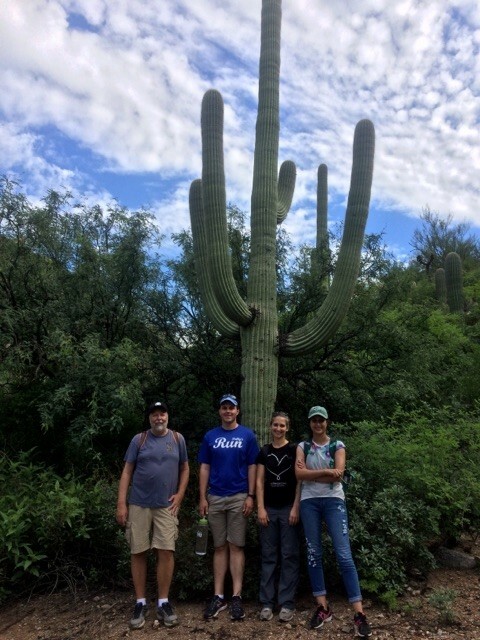 The CW3E group with a saguaro during the Ventana Canyon hike. From left Marty Ralph, Brian Henn, Anna Wilson, and Maryam Asgari-Lamjiri. Fig.2. Example of landscape 30 miles southeast of Tucson, near Sonoita, AZ on 29July 2017 at about 5000 ft MSL. 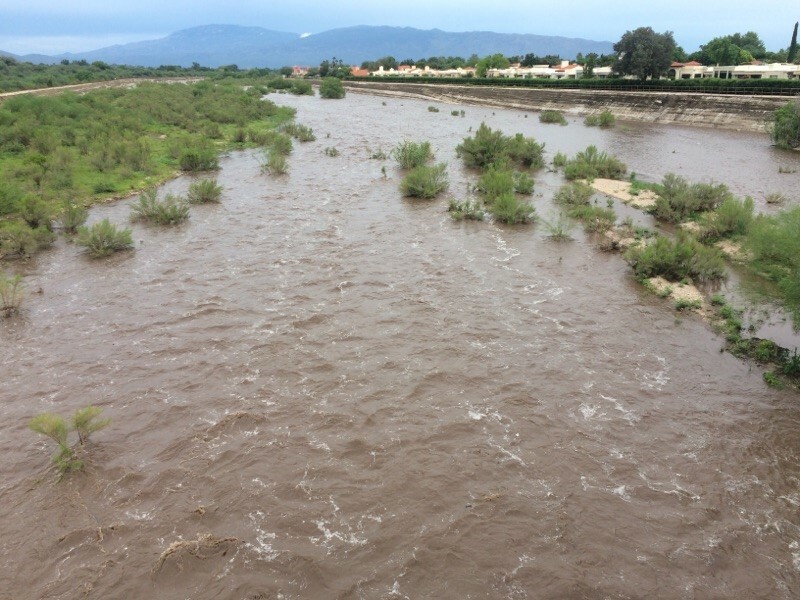 A highlight was observing flood water in normally dry washes, such as Tanque Verde Wash in northeast Tucson (Fig. 3). Fig.3. The Tanque Verde River looking east from the bridge on Kolb Road after monsoon storms in the Tucson area. The Rincon Mountains, including their high point at 8664 ft MSL, are in the background. Photograph taken at 6:45 pm local time on 29 July 2017. Precipitation totals in Tucson were significantly above normal. Fig. 4 shows the July 2017 climate summary from NWS. 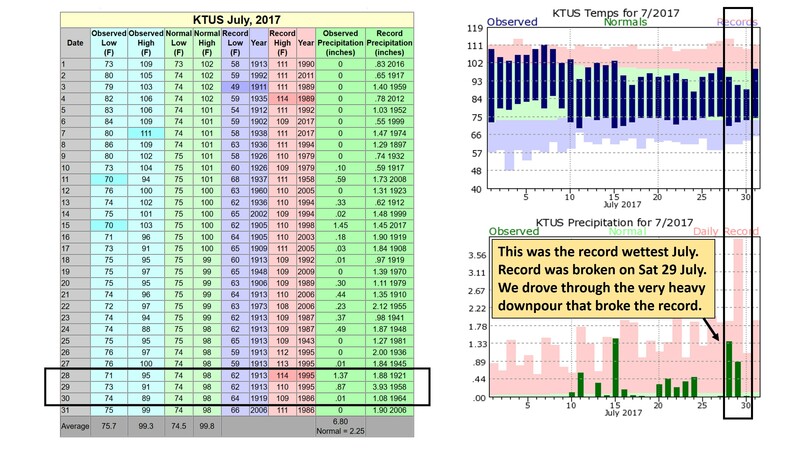 In fact, the CW3E team experienced the heavy downpour near the Tucson airport on Saturday, 29 July 2017 that broke the all-time record for July monthly precipitation (now 6.8 inches; previously 6.24 inches in July 1921). Fig.4. National Weather Service July 2017 climate summary with dates of the CW3E field trip highlighted. CW3E’s goal is to revolutionize the physical understanding, observations, weather predictions and climate projections of extreme events in Western North America (http://cw3e.ucsd.edu/overview/), including the North American summer monsoon. Points of contact: Anna Wilson, Marty Ralph.